Since we have so many options for FD big brake kits, I wanted to push through some of the anecdotal information and take a look at the facts. The big brake kits I’m analyzing are the ones I’ve been able to find good info on are: AP racing (Sakebomb), Stoptech, and Wilwood. Other kits that I didn’t look at: Racing Brake, Ksport, and Brembo. I’m not looking at these because these companies don’t publish their piston sizes (good way to get me to not buy your product). If anyone can find this info, let me know and I’ll look at them. What I’m looking for in a big brake kit: 1. Larger/thicker rotor for better heat management, 2. Good pad selection, 3. Good brake bias. #1 and #2 are accomplished by all of the kits I looked at, but #3 is the big question, and the published data can help answer that question. -	My calculations start with the force input into the master cylinder. I wanted to start with the force input into the brake pedal, but I would be making too many unknown assumptions about the brake booster (spring stiffness, how the double diaphragm works, stiffness of the membrane, yada yada). After the master cylinder, I calculate the brake system pressure, taking the proportioning valve into consideration. After that, the normal force that the caliper pistons exert on the brake pads is calculated, torque on the rotor, and then force at the tire contact patch. -	For the proportioning valve, Mazda publishes the “switching point” being at 570 psi. So before 570 psi, the front and rear brake pressures are equal. After 570, the rear rises at a rate of 0.57:1 with front brake pressure (I don’t know this to be true, but I read on another forum that most prop valves behave this way). -	Assuming the pad radial width for every brake system to be 50mm, so the effective radius of each rotor is 25mm smaller than the total rotor radius. 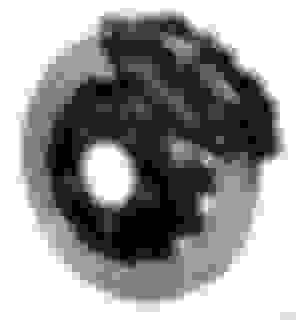 I’m just assuming 50mm across the board because the radial width of the pad isn’t always published. 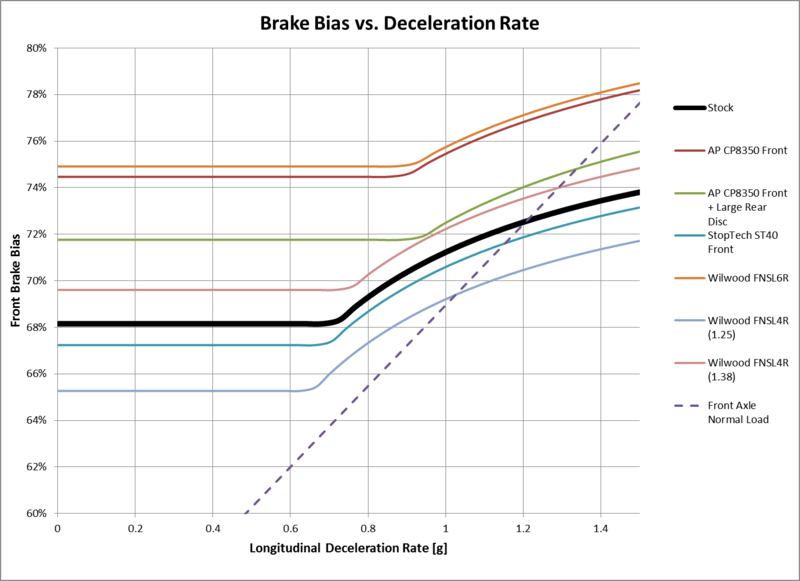 The above chart shows brake bias vs. the deceleration rate of the car, in G. I’m also showing the load on the front axle vs. deceleration rate, due to load transfer. A perfectly balanced system would have the brake bias intersect the front axle load at the point where the brakes lock up. So, for example, if your tires begin to lock at 1.2 g (probably in the Bridgestone RE-71 range), then the stock brake bias works well. (take that statement with a grain of salt though, a lot of other things play into “what’s desired” from brake bias). The knee in each curve is 570 psi, where the stock proportioning valve switches. It should be noted, an adjustable proportioning valve can be used to move the knee to the left or right. Stock – Seems like a good balance for street tires. AP CP8350 – This is the Sakebomb kit. Very front biased, a 6.5% increase in front bias from stock before the prop valve switches. Prop valve opens much later. Increased piston diameters and a larger rotor both add to the front bias. People have commented that this kit seems very front biased, and it’s easy to see why. Might be ok for a race car running slicks and/or downforce though. 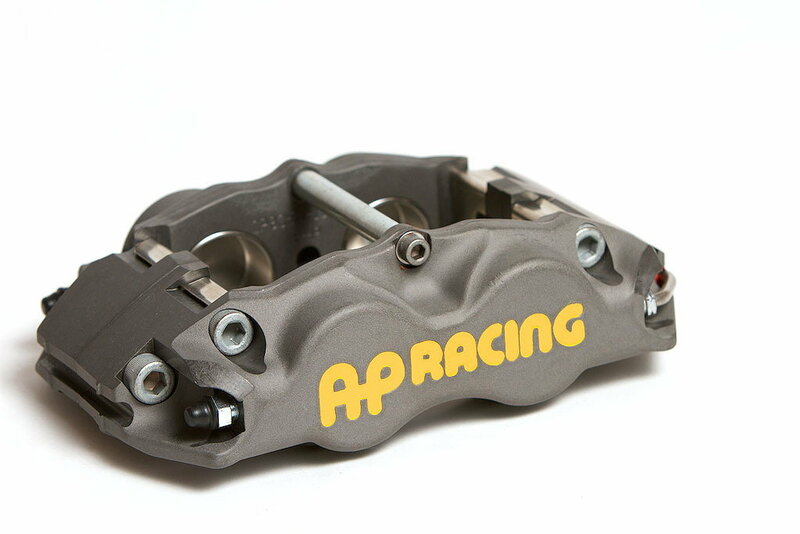 AP CP8350 + SBG rear – Sakebomb also makes a bigger rear rotor + relocation kit for the stock rear caliper. Combine this with the CP8350, and it helps the situation a little bit. Still looks really front biased though. Stoptech – This looks like a company that’s done their homework. They use pistons that are smaller than stock to offset the increased braking force due to the larger rotor. The result is a brake bias that is within 1% of the stock bias. Wilwood FNSL4R (with 1.25” pistons) – Would have to call Wilwood and ask them to substitute this caliper in the above kit. I like this caliper in a 4 piston configuration since all of the pistons are next to a “wall” in the caliper, so it seems like it would be stiffer. Adds a little bit more rear bias, which should be helpful for autocross and tight tracks. It would also be easy to tune this kit with an adjustable prop valve (turn down the rear pressure / shift the knee to the left). The disadvantage (not graphed): a 10-15% increase in pedal effort. Wilwood FNSL4R (with 1.38” pistons) – Same as the above, but a little bit more on the safe side for bias (1.5% more front bias than stock). Pedal effort is more similar to stock, (with a slight decrease). 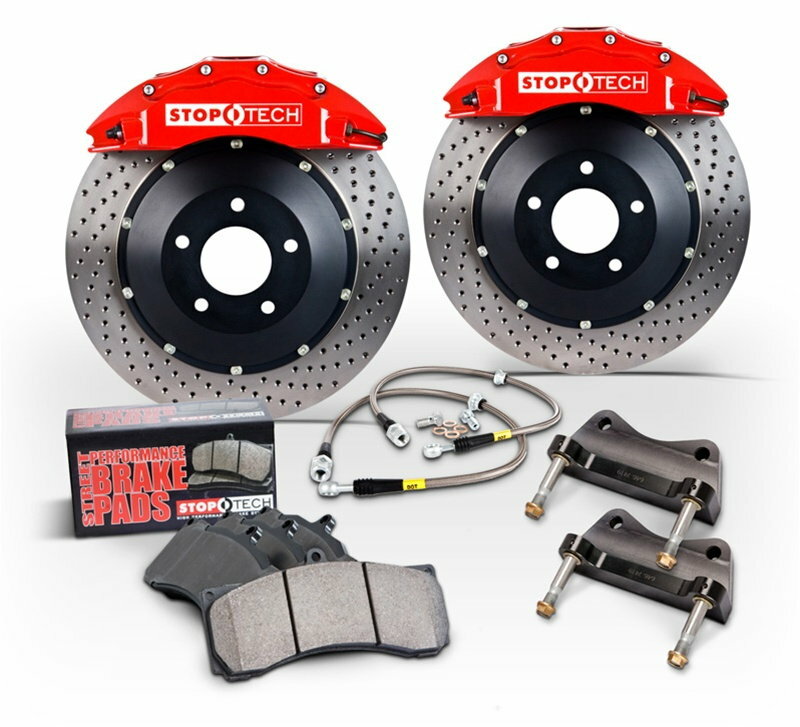 Stoptech is the only kit with published data which keeps a similar-to-stock brake bias out of the box. Wilwood has a couple of caliper options that can improve their kit quite a bit. Everything else seems like it has way too much front bias (unless you have a ton of load transfer i.e. slicks/aero). For me, I track my car with 200TW tires, and no aero. I also do a good bit of autocross. 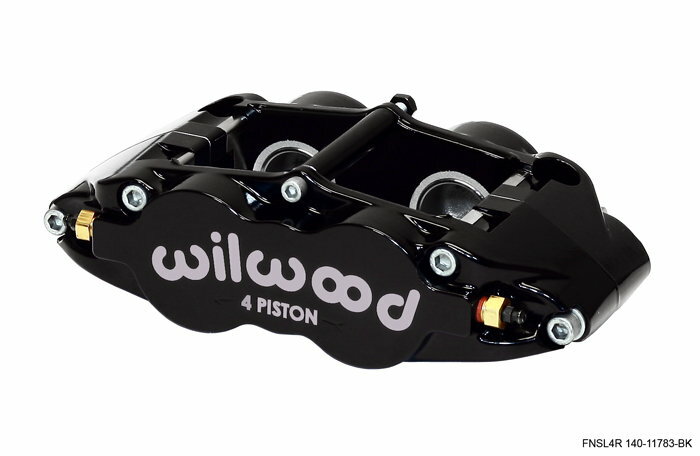 I’ll be going with one of the Wilwood 4 piston options, I just need more seat time in my car in its current configuration to decide if I need more front bias or less. I was able to talk to the owner of Stoptechs about braking for the FD. He taught me a lot. Basically The braking system is all about balance and with a larger diameter rotor, you need less mechanical grip to get the vehicle to stop. So that is why you see the piston diameters on the stoptech kit are smaller. They simply dont have to provide as much pressure since there is more leverage with the caliper being farther from the center of the rotor. If you want to run the AP racing kit a new 929 master cylinder will be required. It was Mazda's way of pumping less pressure thru the system instead of designing new calipers. Stoptech made the kit work well with the stock Master Cylinder. If you decide you want a rear kit as well, they can make one for you as well. It really comes down to what you do with your car and how long are your track sessions, then you can decide if a rear setup is necessary as well. AP has a 6 piston front kit for the FD using the CP5570 calipers. I'll add it to my spreadsheet soon to see how it stacks up. And a quick look at that AP 6 piston, piston sizes are 38.1mm, 31.75mm, and 27mm staggered. So the total piston area per pad is exactly the same as their CP8350, giving the same front-heavy brake bias on our cars. AP's 6 piston design has a much beefier bridge/brace for the middle piston, though. Definitely looks stiffer than the Wilwood 6 piston. Tiny note: the StopTech front rotors are 332mm. They also offer an alternate caliper sized for the 99 rear brakes. I run the ST original with RB rears, so I'm probably a little rear biased vs stock. But with a 929 MC, the pedal is amazing. Ive seen a lot of wilwoods leaking fluid after a short time and I believe the quality of the aluminum is soft. Also a lot of stripped bleed screws. I would go stoptech for your street based application. I've seen good results and a ton of top teams use them in world challenge. When I upgraded my brakes I had some experience before with my prelude and also a little more experience with the rx7. I upgraded to the 99 spec rx7 brakes both front and rear. It was extremely cheap for me to do so and its also the best solution in terms of brake bias and using stock components. The quality of the 99 spec brakes are also OEM quality and will be very long lasting. I decided to rebuild my calipers as well to ensure a proper functioning system. I was fortunate enough to buy the front calipers for $149 shipped, they were spirit R's and they came with Endless CC-R brake pads. steal of a deal. All you need in the rear is a larger bracket to relocated the stock rear caliper. When I ran just different pads (bluestuff front and redstuff or yellowstuff rear) when braking at high speeds, over 100mph, the rear of the car would sway back and fourth under braking, not a good thing. The same thing happened when I had a BBK BAER with my honda prelude, went back to stock and the braking was a lot better. Brake bias is a huge deal and the main reason I went to a 99 spec upgrade. cost was cheaper, brake bias the same, uses the same brake pads, MUCH larger rotors in terms of a heat sink, and OEM quality and reliability. run the same pads front and rear. It's nice to see you doing your homework. I would like to comment that while brake bias and the dynamics surrounding it from a driving perspective is of obvious concern. I think there are larger factors that necessitate brake upgrades for those shopping for braking solutions for thier car. The biggest is probably brake fade and wear due to heat and abuse of repetitive high speed deceration in brake zones while on track. The larger and thicker discs alone regardless of clamping force exibited will do its job decreasing fade as it is essentially a larger heat sink and can absorb more heat before heat soaking to the point where it's transferred to the fluid that will eventually boil. Any will do the job and bias can be adjusted manually and cheaply so you can tune your setup for optimal bias and dynamics for your driving style and use. Most front brake upgrades are going to provide you with what you want. The things I would look at would be the parts availability for discs, caliper rebuilds and brake pad choices, cost is relative of the pads and discs and rebuild parts are scarce and or expensive. In my opinion if you leave the ABS in the car and are on street tires and are just doing solo events the stock brakes are fine. Upgrade the Master and or pad choice if you want more initial bite. The cars are so light they go a whole season on stock brakes. Attached is a xls file to input different brake options. I have not had the time to input the current options as this one listed quite old FD brake options. Anyone know how to properly calculate brake rotor annulus width as indicated in the attached sheet? A previous member made this sheet and I am trying to add the current available options. It looks like this files calculates braking based on rear rate of 11/28(0.39) after the kneepoint, while the original post said they assumed 0.57 rate. Does anyone know what it actually is on a stock FD? If looking for a front/rear bbk pb/kspork/cieka all offer front/rear setups that work with the oem handbrake. Last edited by tys93r1fd; 06-26-17 at 07:57 AM. Also according to the attached 94 workshop manual, the knee point is 570psi however the rate after the knee is roughly 0.33. If so, this does skew the chart above. What are typical braking rates on r-comps or slicks at track days? I keep coming back to this thread and not sure any big brake kits are worth the extra money over a full 99 spec front/rear setup? According to the chart in the OP, a stock balanced car will be good up until around 1.2g deceleration where as the nice sakebomb front/rear kit would be good until 1.3g. Is it worth the upgrade for the thicker pads etc...? Last edited by Brekyrself; 11-18-17 at 03:37 AM. Depends what you're doing and driving style! Some may get brakes to last a season - as above - but beyond autocross, you can go through a set of stockers in as little as a weekend and burn up the dust boosts in a couple of laps. Good floating discs will reduce replacement from cracking if you're punishing them - along with a better pedal. Typical pad is larger and thicker and better insulating, with much greater variety of racy compounds available at near equivalent cost to the few limited brands that stock Mazda shapes. At one particular high speed track here, you'll fade them pretty bad after a handful of laps, no matter what. CC-r mentioned, wouldn't cut it and have you in a wall after doing a couple probably as well. Thanks for the info. I typically do track days and had good luck with quality rotors + hawk dtc60 front/rear with Ti shims. That however was on stock twins with around 300rwhp, this year will be a single turbo setup carrying much more speed into the braking zones. Obviously the best setup would be an aftermarket kit with a proper manual brake + balance bar adjustment however that is out of the question for this year. I'm on the fence as sticking with the factory ABS & prop valve seems the larger OEM setup would provide the best balance however just be limiting down the road. Circuits, that aren't high speed and are more flowing, rather than the usual straight, with hairpin designs we suffer with over here, might present less problems for you. Do find, as well as the pads, the big rotors, either oem or Japanese aftermarket, aren't much cheaper than a proper directional vane racing item over here at least. On the other hand, with the flimsy hubs, larger aftermarket brakes and stickier tyres will only exacerbate the issues there.....and there appears to only be dubious quality replacements available this side of the big lake. 100% agreed plus the aftermarket BBKs can offer a ton more of heat dιssipation due to the much larger and thicker discs. As already stated above, brake bias is only half the truth and although crucial it is not supposed to be the reason why someone goes to a BBK. Otherwise you can just opt for a brake bias regulator and thats that. Damn i have read all of this twice and i am still not sure which brake kit. I am leaning on the stoptechs. I currently have no abs and brembo sloted/drilled disc with hawk pads. I have a lot of fromt brake lock up and just ordered a willwood brake pressure valve. My car will be a weekend car with occasional trackday events at pbir and seebring. You'll do pretty well with the StopTech, it's well matched to the OE rears, and reliable. I am in the same boat as you man ive read this thread so many times. I still dont know what route i want to go. My setup is going to be no abs and im torn between SBG Ap kit or the wilwood kit. I will have a prop valve so adjusting proportioning is of little worry. Anybody else have some long term reviews on the wilwoods? Thanks for the info man! I ended up opting for the wilwood bigger piston with you guys rear kit. Love it! Sorry for bumping a relatively old thread, but I think it would be helpful if you'd address why the brake bias still front heavy for AP brakes even when they are combined with your rear comp kit. From what I could gather, Stoptech = retains stock balance but with relatively heavy calipers, and AP Comp + Sakebomb rear = bias shifted to front with lighter calipers. If this is the case, I would take the former without any hesitation because for me, brake balance is far more important than saving few lbs.